He’s almost as famous for “Dufnering” (Google it – it’s family-friendly) as for winning the 2013 PGA Championship, but Jason Dufner’s grip is all business. 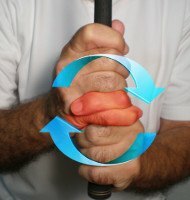 It’s somewhat surprising that Dufner uses an interlocking grip since the man he emulates, Ben Hogan, employed the overlapping style. More noteworthy, Dufner’s strong hand position is markedly different from Hogan’s weaker hold. Yet this doesn’t prevent Dufner from achieving a Hoganesque backswing, with his right elbow tucked very close to his side and his left arm in a very “flat” or horizontal position. 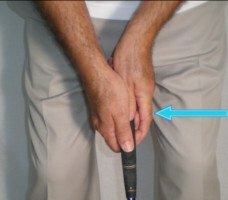 If you’re looking to cure an overly handsy or wristy putting stroke, you’d be wise to study the Jason Dufner grip. 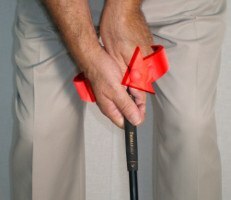 Not so much his hold on the club – it’s fairly conventional, if a little to the strong side – but the actual grip installed on his putter. It’s an oversized model measuring 1.3” in diameter, which effectively mutes the effect of the small muscles in the hands and wrists. Whatever you may glean from analyzing Dufner’s grip and swing, it may be more instructive to study his career arc. 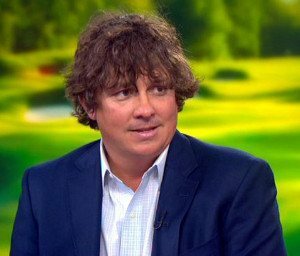 Dufner was a classic “journeyman” before his breakthrough season of 2009 at age 32, but he didn’t really take off until two years later. In other words, perseverance pays.